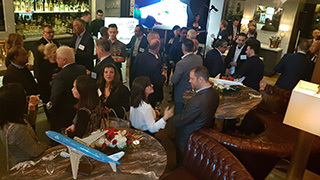 Delta Air Lines along with its joint venture partners celebrated the annual Agency Elite Awards last week in Toronto with a lavish family style Mediterranean feast at Estia restaurant. 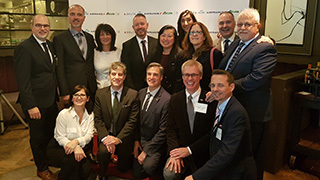 Steven Larkin, DL’s Director of Sales for Canada, kicked off the festivities with a warm greeting to all the airline’s top agents, saying that he and his 100 DL/AF/KL/AZ JV Canadian colleagues consider them to be family. A quite appropriate sentiment considering ‘Estia’ means “home” in Greek. And it seems that the JV partners do feel very strongly about treating their family members very well. 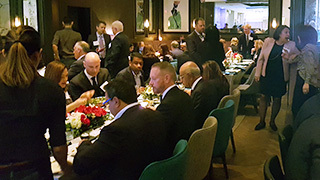 The camaraderie was visibly warm as management and representatives mingled with top-performing clients. Rob LeBel, Managing Director Specialty & Canada Sales for DL cited the irrefutable statistics that its top Canadian market performers are delivering. Traffic was up 23% over the past year -- excellent by any measure! LeBel cited the booming traffic on African and Indian routes in particular. Along with such considerable success DL, AF, KL & AZ will celebrate several additional milestones and achievements over the coming year. All of KL’s aircraft on Canadian routes will feature new cabin interiors as aircraft will be completely refurbished by the beginning of the next season. And as KLM is set to celebrate its 100th anniversary in 2019, the new Crown Lounge at SPL is nearing completion and will open this spring. Another development is DL’s enhanced Joint Venture with WestJet. As announced earlier this year, the codeshare agreement between the two carriers will considerably expand to deliver growth on trans-border networks along with co-location at major hubs, as well as frequent flyer program alignments and reciprocal elite benefits. The result should be more seamless passenger and baggage transit. DL will also introduce its new fleet of Airbus A220 aircraft, which will enter service early in the new year. The aircraft, formerly known as the Bombardier C Series, are assembled at Mirabel under the Airbus/Bombardier C Series Aircraft Limited Partnership. Delta is the largest A220 customer with 75 firm orders.